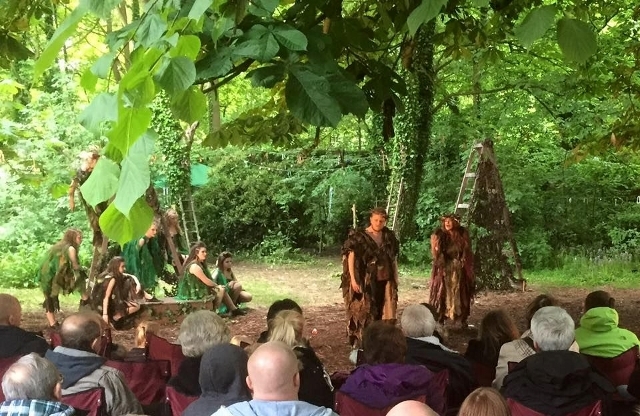 Due to popular demand, award winning MATE Productions in partnership with Shakespeare North and Royal Shakespeare Company Open Stages programme has arranged another performance of Midsummer Night’s Dream in Prescot. So if you didn’t get chance to catch the sell-out event last week in Prescot, you can now book tickets for the additional performance on Saturday, 8 August at 7pm. The finale event will take place in the beautiful 15th century church and woodland gardens of Prescot Parish Church. Over 100 local community actors, dancers, musicians, singers, sewers, crafters and volunteers aged 8 – 79 years have been working for the past 7 months with MATE Productions’ team of professional practitioners to create this magical outdoor promenade performance of Shakespeare’s most loved comedy. With live musicians and singers, fairy dancers, stunning design and a talented local cast, this production promises to be magical, unique, family-friendly and fully accessible for wheelchairs and pushchairs. The surrounding woodland in the churchyard is transformed into a midsummer’s fairyland, with dream catchers and magical artefacts hanging on the trees which have been made by local school children. Families are being encouraged to bring their children to performances dressed as flower fairies or naughty sprites. There will be a BBQ and facepainters before the show and during the interval and children can choose fairy flower designs or the tribal markings of a sprite. As well as the additional date in Prescot, you can also catch the performance in Halewood at St Nicholas Church gardens, Church Road, Halewood on Sunday, 21 June at 2.30pm and 7.30pm. Outdoor seating will be on comfortable camping chairs (provided) or you can sit at the front on one of our picnic blankets. Don’t forget waterproof clothing in case of rain – please no umbrellas unless you are seated at the back as it will obscure the view for other audience members.